A Fast, easy and impressive smoked ham that is full of flavor. It’s the perfect combination and pairs well with just about any side dish! In a small bowl , combine the all the ingredients. Do not save a lot on herbs, use at least one tablespoon each. Give some cuts in the ham in a diagonal crosshatch pattern without cutting much into the meat. 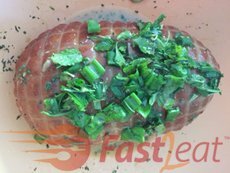 Rub the herb mixture all over the ham and set aside to marinate at least for 30 to 45 minutes. You can do it a day or two ahead of time, which is nice because you can focus on other aspects of your meal! Preheat the oven to 180°C (350F). Place the herb crusted ham in a roasting pan . Bake for about 45-60 minutes per kilo (15 minutes per lb.) uncovered. I prefer to use the Countertop Oven than the big stove one. It’s time and energy saver. Remove from oven and serve the sauce over the ham. Serve with your choice of side dishes – Creamy Fancy Coleslaw Fast2eat Recipe, green salad, roasted asparagus, mashed potatoes, rice, quinoa Salad, couscous … would go perfectly! However, this ham will go great with just about any side dish you want to serve. Hope you like it! The great thing about making a smoked ham is that it is already fully cooked, so it just needs to heat through. You don’t have to worry about it as much as you would when roasting a turkey.